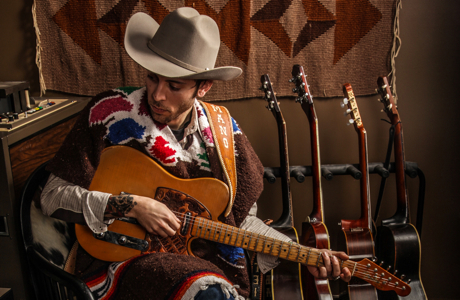 Anyone who hasn't paid much attention to Daniel Romano since his days with Welland, ON alt-rockers Attack In Black can be forgiven for doing a double take when seeing the cover of his new solo album, Come Cry With Me, for the first time. Romano's love of country music developed early in his life through his parents' record collection, but, not surprisingly, was temporarily replaced by punk in his teen years, which led to the formation of Attack In Black in 2003. However, once Romano helped launch You've Changed Records in 2008, with former AIB bandmate Ian Kehoe and Baby Eagle's Steve Lambke, his rustic roots started showing with two acclaimed solo albums, Workin' for the Music Man and Sleep Beneath the Willow. On the cover of Come Cry With Me, Romano sports a custom-made rhinestone suit and matching cowboy hat, a heartfelt tribute to country music heroes such as George Jones and Hank Snow who, in recent years, have become his strongest musical influences. The songs on the disc are equally reverential, capturing a vintage late '50s/early '60s vibe, best heard on opening track "Middle Child," on which Romano displays a remarkable vocal range. For those who may doubt his commitment to this approach, Romano tells Exclaim!, "This has to be the path I follow because I'm sitting on so much material. I finished this album two years ago, and I've written 40 songs since then. It's definitely the style I feel most comfortable with, and I'm not going to change anytime soon." With Come Cry With Me, Romano has found a home in both Canada and the U.S. on new label Normaltown Records, an offshoot of New West Records, and is set to prove that he's more than capable of holding his own within the American country music scene, on top his current opening slot for Whitehorse that continues across Canada throughout March. "The only thing that worries me is that the layman may interpret all this as being hokey," Romano says. "I don't really know what I can do to stop that, but there's nothing ironic about what I'm doing. Each of us in Attack In Black liked different music, and I was always on the folk/country side of things. We did start out as a punk band, but once we allowed our individual tastes to blend together, that's what our sound became." Come Cry With Me is out now on Normaltown Records, and you can see all Romano's upcoming dates here.